Portland-based writer Bre Cruickshank makes a sober assessment of America’s consumption problem, and why your best efforts to resell and recycle can’t resolve the devastating environmental impact of fast fashion. What really happens to the clothes we donate to charitable organisations today and what kind of impact does it have on the third-world countries where our discarded garments end up if they make it past the landfill? Sitting in the corner of my closet is a brown paper bag filled with castoff clothes. Despite my best efforts to avoid needless purchases, ill-fitting jackets, and outdated dresses continue to accumulate like dust in the dark corners of my apartment. These are the inexpensive, expendable clothes I plan on donating to my local Goodwill or Salvation Army. For most Americans, this process of purging is nothing new. Making charitable donations is practically routine for consumers like me, who recoil at the idea of throwing away usable, once loved clothing. After all, a decent portion of my own wardrobe is secondhand. I always figured my unwanted clothes would find a second life with a thrifty hipster who would cherish them more than I had. It wasn’t until I began researching for this article that I discovered I was wrong. Supply has begun to far outweigh demand when it comes to used clothing. The Salvation Army was founded in the 1880s when most clothes were still handmade and donations were usually in great condition. A dramatic shift came when consumer culture set in during the postwar 1950s. Increased incomes led to diversified wardrobes, and charities began receiving enough donations to open retail outlets primarily for the sale of secondhand garments. But it wasn’t until the onset of fast fashion in the 1990s that things took a turn for the worse. Unsurprisingly, the sharp decline in clothing prices has had a dramatic effect on shopping habits. Americans now buy five times as much clothing as they did in 1980, and this trend has had far-reaching side effects. In the 1990s, donations to Goodwill increased by 10 percent every single year. Despite the rapid rise in donations, today’s mass produced clothing is of such poor quality that even if it’s donated, it’s often deemed unfit even for Goodwill. “Particularly due to the advent of cheap, disposable clothing, charities have seen themselves transformed into dumps that accept clothes of varying condition in ever-increasing volumes,” says Elizabeth Cline, author of Overdressed: The Shockingly High Price of Cheap Fashion. 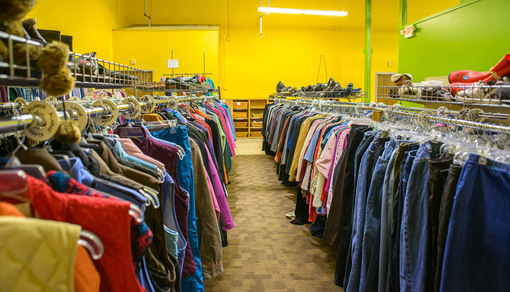 Nowadays, less than 20 percent of clothing donations made to charities are actually resold there. 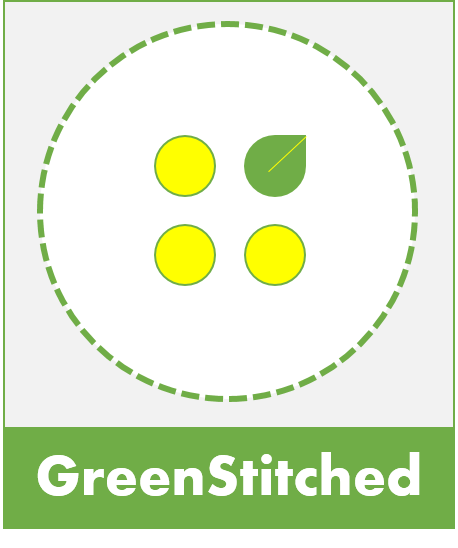 Increasingly, textile recyclers are being relied upon to manage an unstoppable influx of clothing. The recycling industry is as old as textiles themselves, but the staggering spike in consumption has given it new life. Today, the majority of clothing donations, about 45 percent, are exported by for-profit recyclers to developing countries around the world. It turns out that this market, born entirely of our unwanted duds, is thriving. Robert Goode is the owner of Mac Recycling, a company that ships enormous bales of used clothing purchased from charities to buyers all across the globe every week. “Pretty much you can pick any country and there’s a market for these items,” he says. The international roster ranges from Central and South America to Asia, Africa, and Europe. Though textile recyclers have endured their share of misunderstanding, they provide an inarguably valuable service to charities. 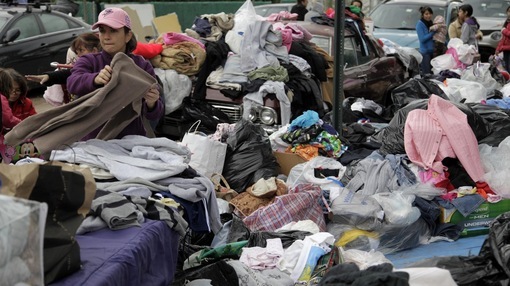 To put it in numbers, the U.S. currently exports a billion pounds of worn clothing per year. Without the intervention of textile recyclers, our enormous surplus of charitable donations would be rendered useless and sent to landfills. In addition to reselling overseas, a significant amount of used clothing is recycled by textile processing facilities for commercial and industrial use. Around 40 percent is claimed by one of the U.S.’s 3,000-plus textile processing facilities and made into wiping cloths, insulation for homes and cars, or carpet padding. 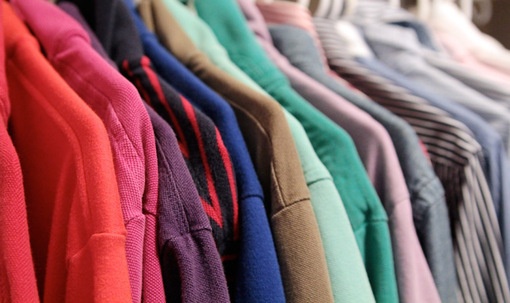 Recently, clothing companies have begun to incentive recycling themselves with programs geared towards decreasing waste and closing the production loop. Fast fashion giant H&M has begun what it claims to be the first garment collection initiative in the fashion industry. “Today, you can hand in any clothes you no longer want. That way, we can reduce waste and give old products a new life,” says the company. Consumers are offered discounts or vouchers as a reward. It’s an ironic approach given that H&M’s success is dependent on the continued consumption of cheap, trend-driven fashion. Nonetheless, it’s a better alternative than throwing old clothes away. Out of the clothing donated to Goodwill for resell in 2014, a whopping 11 percent was sent to landfills, the transportation of which cost the organization millions of dollars. 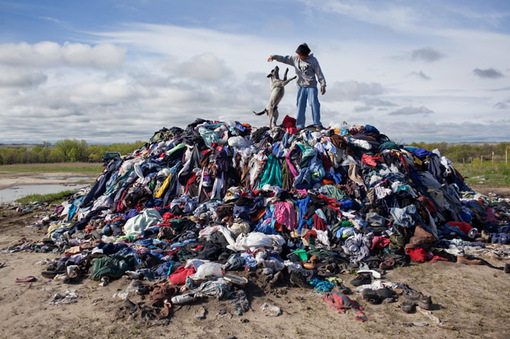 “Every year, Americans throw away 12.7 million tons, or 68 pounds of textiles per person, according to the Environmental Protection Agency, which also estimates that 1.6 million tons of this waste could be recycled or reused” asserts Cline. America’s consumption problem is a big one that even our best efforts to resell and recycle can’t resolve. It’s time to take responsibility for the life cycle of our clothing. While up-cycling, mending, or making charitable donations continue to be viable routes to take, arguably the easiest and most economical way we can have a positive impact is simply by reducing the amount we consume. Rather than constantly refreshing our wardrobe according to seasonal trends, we can invest in timeless styles of better quality. Most of us have at least a handful of special pieces we wear time and time again, regardless of what’s heading down the runways. For me, it’s a vintage coat made of rabbit fur and suede that will be a staple in my wardrobe for a least a few decades. The power to re-frame clothing as meaningful investments rather than expendable bargains is in our hands and our wallets. Fast fashion may be the rule, but we can be the exception. This entry was posted in Recycling and tagged Consumerism, Fast Fashion, Goodwill, H&M, Salvation Army, used clothing.